This post is by guest writer Adeline Zhang. When I first found out this anime was in production I could barely contain my excitement. Mekakucity Actors is based off of a manga called Kagerou Daze which in turn is based off of a series of vocaloid songs composed by Shinzen no Teki-P (aka Jin). These songs are collectively known as the Kagerou Project. Although I don’t particularly like vocaloid songs, the intricate plot created by the sequence of songs drew me in. It was not just the typical story about children with special powers – the characters and storyline had much more depth than that. Naturally, I looked forward to the anime based off of the Kagerou Project and had similar expectations. Unfortunately, I was disappointed. While Mekakucity Actors sported a highly unique and creative plot with balanced and effective character and setting development, the overall execution was not so exemplary. It not only strays from the original plot slightly but rushes through it, making the story too difficult to follow. It’s hard to like something you don’t understand. The story revolves around a group of teenage children who call themselves the Mekakushi Dan (Blindfold Group). All of them have special powers linked to their blood red eyes and have experienced a mysterious phenomenon, referred to as the Kagerou Daze. Pulled together by a common cause, they unite to unravel the mysteries of this strange phenomenon and their eye-related abilities. Mekakucity Actors instantly grabbed my attention with a unique art style and a tense hostage situation in a department store. 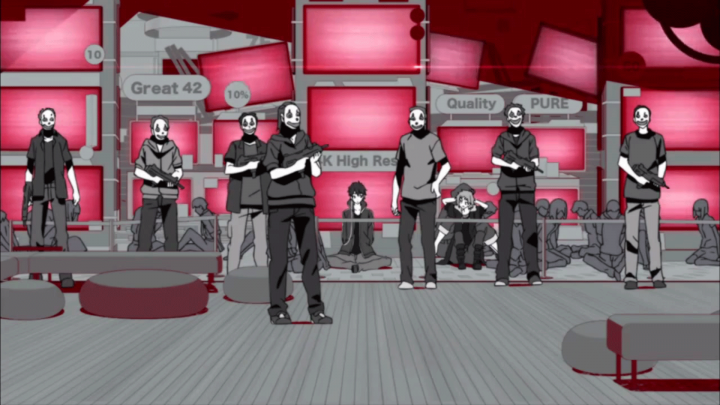 The terrorists and environment are presented in a monotone black and white scheme, punctuated by bursts of color from the Mekakushi Dan characters. It sets the tone that the Mekakushi Dan almost live outside of reality and have a special connection with each other. As the hostage situation unfolds though, the plot gets seemingly scattered as special powers are mentioned with no explanation and characters are introduced with no background. But after Shintaro, the main protagonist, states that he has a plan to stop the terrorists with a 100% success rate, the intrigue is more than enough to keep me watching. Within the first few episodes the plot starts to tease at something deeper. Episode three creatively links the previous two episodes by replaying events through another character’s perspective. It seemed as if there was some supernatural intent hidden behind coincidence — a destiny-like force, playing upon the lives of these children. Similarly, the use of surrealist animation alludes to the supernatural context of the story. There is a sense of being flipped between reality and illusion, highlighted by striking color schemes that make the scenes lively yet dream-like. With Shintaro’s fate unknown after he faints at the end of episode three, I was fully invested in unlocking the mysteries behind the Mekakushi Dan. As the anime continued, I grew more attached to the distinctive characters and the unique animation style. Mekakucity Actors introduces you to several characters per episode which is a lot to keep track of, but fortunately each character is special enough to be memorable. Hibiya is an elementary school student infatuated with his classmate, recklessly throwing himself into the Kagerou Daze for her sake. Ene is a special needs student who is trapped inside a program, using her holographic avatar to annoy the rest of the group. Every character in the anime has a one-of-a-kind quality that makes each scene unpredictable. Meanwhile, the peculiar animation style continually impressed me as it constantly paralleled the current state of the Mekakushi Dan. In the Kagerou Daze, almost everything is shades of blue and white. 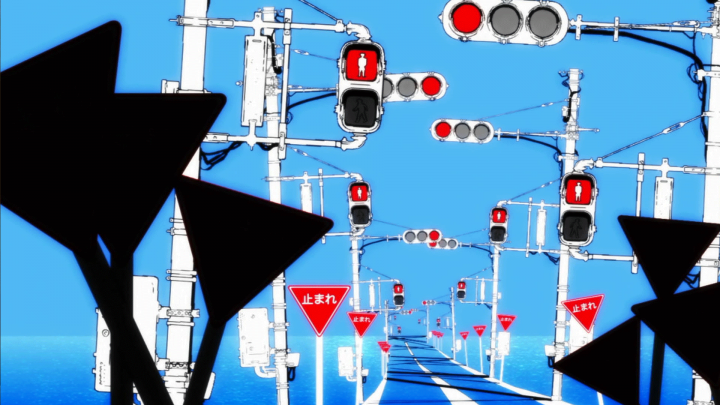 Hibiya’s experience of the Daze and the details of the background, like the telephone poles, are only presented in this limited color palette. With only small doses of red in the stoplights and signs, the overall image is very surreal. On the other hand, the reality world is mostly represented by the colors of the Mekakushi Dan members. When something happens to a character, that character’s color becomes the primary hue of the background — such as when Momo tries to escape the mob, everything turned to Momo’s orange. At this point of the anime, the character development is well progressed but plot coherence is getting sloppy. The storyline jumps back and forth from past to present and sometimes even to the future, making it difficult to keep track of when things are happening. 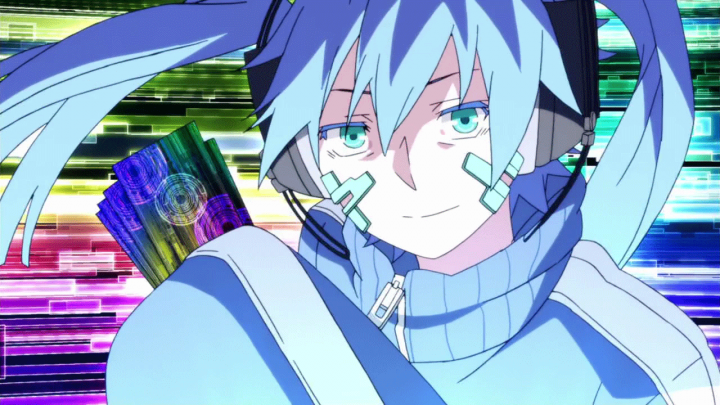 Ene’s flashbacks are abruptly interrupted with snippets of another member’s past. Suddenly, Shintaro is shown in the hospital because of an accident that happened in the present. It all seems a bit misplaced but with a little deduction, I can still make sense out of the anime. The more unforgiving problem was that the animation’s decreasing quality took away from the overall experience. The background started looking like the animation studio just repasted the same set of images over and over. It’s hard to believe that every building within an area would have the same exact patterns of deterioration, down to the angles of broken glass. Also, at times the animation didn’t even seem to be interacting with the environment. 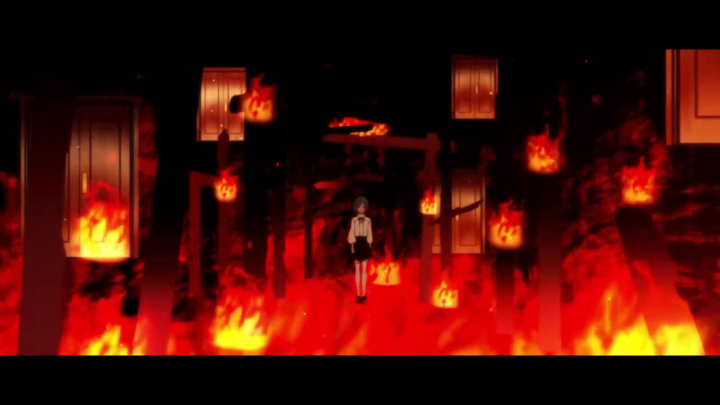 Some of the flames in episode eight were floating randomly in midair and the stairs and doors didn’t even look like they were burning up. Even the characters felt devoid of expression and were overly simplistic. I was much less excited throughout these episodes simply because of the disappointment the animation brought me. 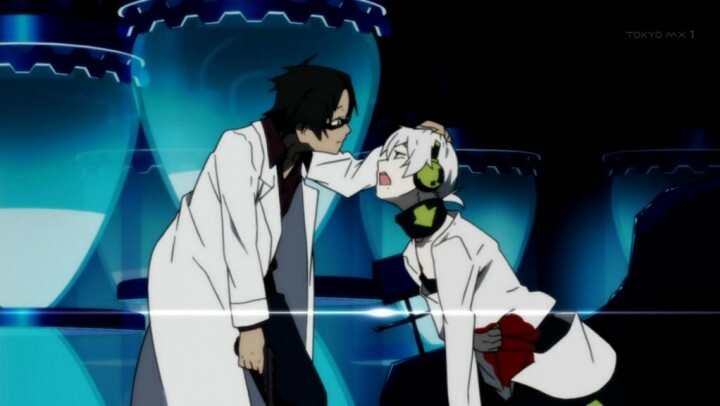 Mekakucity Actors’ execution did not live up to the Kagerou Project’s reputation. The last few episodes were a complete mess — they were rushed and the plot advancement became so choppy that the sequence of events felt random and lacked context altogether. Why was Shintaro in an unexplained dream? How is Momo being imprisoned relevant to the storyline? Why does it matter that the Mekakushi Dan are fighting guards? And on that note, guards of what? Too many things were left unexplained and I didn’t feel satisfied with the ending at all. On top of it all, the animation never improved after the drop in quality from episode eight onwards. I was utterly disappointed. I honestly only continued watching so that I could finish the anime — I lost the excitement I had in the beginning for Mekakucity Actors. I think this anime had a lot of potential. I certainly had high hopes. However, the originally creative and intriguing plot was contorted so much I could barely make sense out of it. Even my expectations for the animation were upset. But whether it was because of lack of planning or just budget issues, Mekakucity Actors‘ execution did not live up to the Kagerou Project’s reputation.